Every year, Americans throw away $165 billion dollars worth of food—that’s more than we spend on the food stamp program (SNAP), national parks, public libraries, and health care for veterans combined. Around 40 percent of our entire food supply gets tossed in trashcans, dumpsters, and landfills, and we’re not even a well-fed nation. Fifty million Americans, or one in seven, are food insecure and 17 million children, or one in five, go without food on a regular basis. The majority of you reading this likely don’t experience hunger or food insecurity, but the truth is we are a very hungry nation. I recently finished my second bike ride across the U.S. to bring attention to important environmental issues surrounding food, water, energy, waste, and transportation. During my first ride, 70 percent of my diet came from dumpsters, to the tune of 280 pounds of food in three and a half months. This time, I vowed to only eat food I rescued from dumpsters as I cycled from Madison, Wisconsin to New York City. Truth be told, I have eaten like a king—I’m chowing down on whole wheat bread and fruit from a New Jersey dumpster as I write this story. Much to the surprise of many, I am able to eat more delicious, nutritious food from dumpsters than most Americans do from the grocery store aisles. I’ve also never been sick from any of my finds. Over the last few months, I’ve probably spent more hours in dumpsters than your fitness fanatic friend has at the gym. Yet, I’m still blown away almost daily by how much food I find that has been tossed out. I had just a few days in each city to pull these fiascoes together, a feat that was frighteningly easy. In each place, I used social media to find volunteers with vehicles to drive to dumpsters with me since I couldn’t carry all of that food on my bicycle. None of the volunteers had dumpster diving experience and I was completely new to the dumpster scene in each city. To give you a sense of the undertaking, it took four hours of work with one car to pull together the haul in Philadelphia, four hours with two cars in Lancaster, and seven hours in Cleveland with one truck. I’ve learned that I can roll up in nearly any city in the U.S. and collect enough food in one night to feed hundreds of people. While millions of children are too hungry to concentrate in school, perfectly safe food is filling dumpsters across the country. I’m not going to stand for that and I know you won’t either. I am urging grocery stores to stop dumping excess food and to start donating it to non-profits that help people in need. Food donations are a win-win for grocery stores, which are protected from lawsuits by the Good Samaritan Food Act. Supermarkets and groceries get tax write offs, spend less on dumpster fees, and, most important, provide a critical service to their communities. Many stores do not donate because they fear liability, but a University of Arkansas study (PDF) found that there has never been a lawsuit against a grocery store that has donated food to a food rescue program. Thousands of food rescue programs already feed people across America, and thousands of stores already donate to these non-profits and food banks. Nonetheless, we need more stores to donate more often. That’s where you come in. Share this article with your local supermarket and tell them to #DonateNotDump. You can also talk to the store manager next time you’re buying groceries and let them know that food donations are important to their customers. It’s up to us to hold stores and the people who run them accountable to treat the environment and hungry Americans with the respect they deserve. I believe that we are at a tipping point for ending food waste. With citizen action, we can solve this problem and make a dent in our nation’s struggle with hunger. It starts with all of us. This is a huge problem! There's another part of this cycle that needs to be addressed: how to utilize the rescued food. 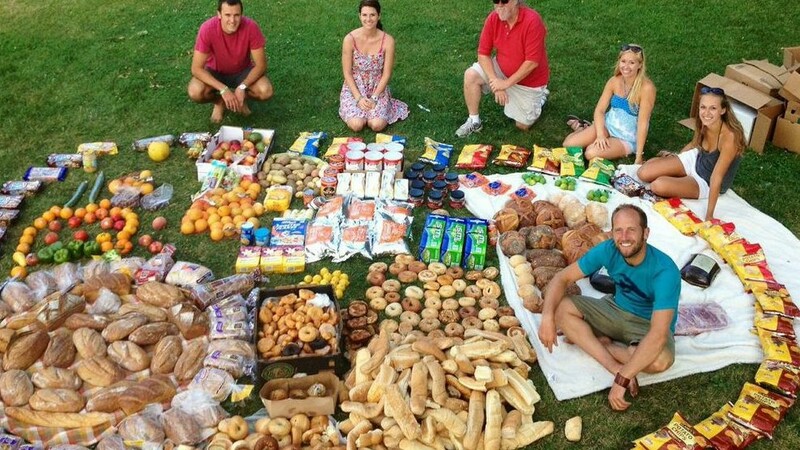 Organizations like Food For Free in Cambridge (www.foodforfree.org) rescue this food and then donate it to shelters. They recently signed a contract to rescue food from local universities -- 14 dining halls that are donating hundreds of pounds EACH a day. The problem... distributing the food. They have a hodgepodge of delicious food that shelters and food pantries won't take because they don't know how to handle it. We need to recognize that rescuing the food is just the first step in reducing food waste. We also need to teach people how to utilize it. So it's not homes that throw all this food away, it's grocery stores? I work at WalMart, and sometimes I help the people in the produce area toss out the 'bad' stuff. Sometimes it might not look perfect, but its otherwise fine (which seems to be most of the cases Ive seen). Id take this food home (or buy it), but guess what? They dont allow that. Any consideration of the safety of this scrounged food? Like maybe a lot of it was tossed out because it fell on the floor or wasn't properly refrigerated or maybe it came in contact with something or someone known to be contaminated with some nasty disease. There are lots of reasons to dispose of food besides just being tired of it or just wanting to waste for the sake of being wasteful. I'm sure you will say you've never gotten sick from eating out of dumpsters but you will never convince me of it. Why should I trust anything you say enough to feed this stuff to my kids? Sure, I could just give it to them and not tell anyone but when they get sick I would feel so guilty. @Andi, food waste is not quite so easy, especially here in the U.S. were it is a huge problem. There is waste at all stages in the food system. Note that "food waste" should NOT be applied to farm fields as actions like gleaning (harvesting unharvested "food") takes nutrients out of the field that must be returned, often in an artificial form. Waste in processing, delivery, storage/display, in the home prior to cooking, and true *waste* (the uneaten portion of a meal) account for the 40% waste figure for the U.S. As the food gets further and further from its original source, it is less likely it can be salvaged. Why so much can be recovered from stores is due to our conditioning to want the most perfect products. Sadly, many places do not donate such food items because of the potential legal liability. Restaurants in our area that used to share food with food banks in our area have stopped because people filed legal actions claiming food poisoning. Very sad indeed. Where I live, in the Czech Republic, there is little food waste, groceries sell almost all food and stuff that is close to expiring or peppers starting to soften are often sold up to 90% off as it can be used in certain recipes, given to farm animals or used for baking. Things like bread and other staples (potatoes, onions, etc...) are very inexpensive, which allows all families the ability to eat and feed their children. Bread that isn't sold is ground into bread crumbs and sold for next to nothing or made into cubes and used for croutons, puddings and various other things. Thankfully I moved from the US to a country that seems to do more things right, than wrong.